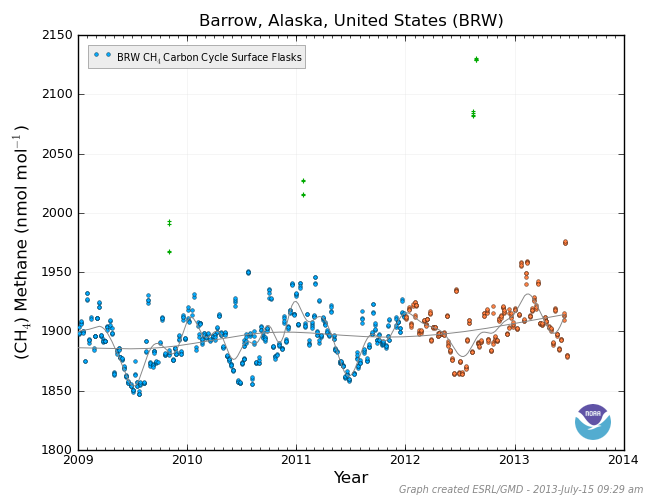 In late June and early July, Barrow Alaska showed two methane readings in excess of 1975 parts per billion. Sadly, this most recent methane spike is likely not to be an outlier. The Barrow spike came in conjunction with a number of other anomalously high methane readings in the Arctic region during 2013. Most notably, the Kara, Barents and Norwegian Seas all showed atmospheric methane levels spiking to as high as 1935 parts per billion during the first half of 2013. Averages in this and other regions around the Arctic are at new record highs even as atmospheric methane levels continue inexorably upward. For reference, Mauna Loa shows average global atmospheric methane levels are now at around 1830 parts per billion. These levels were around 700 parts per billion at the start of the industrial revolution before they rocketed upward, roughly alongside increasing CO2 concentrations, as fossil fuel based industry saw its dramatic expansion over the past couple of centuries. A NASA program is now surveying Arctic methane releases to determine their level of amplifying feedback to human caused warming. Understanding the Arctic’s response to human warming is very important because vast stores of carbon many times the volume of human emissions over the past 200 years lay locked in both permafrost and in methane hydrates throughout the Arctic. As humans have caused the Earth to warm, sea ice and tundra melt have allowed organic carbon to decompose and bubble up in the form of methane and CO2 with ever greater force. Since a significant fraction of these Arctic carbon releases are in the form of methane, and because methane provides as much as 100 times the warming effect of CO2 by volume, even a small proportionate release of this vast carbon store could provide an extraordinarily powerful amplifying feedback to human caused climate change. Recent studies have found that only a 1.5 degree Celsius global temperature increase puts these stores in jeopardy of large release. The amount of warming since the start of the Industrial Revolution is already at least .8 degrees Celsius (about 1/6th the difference between now and the last ice age, but on the side of hot). Perhaps more importantly, temperature forcing by human greenhouse gas emissions have done proportionately more work to melt ice and warm oceans than previously expected. As a result, the ice which locks in these vast carbon stores is disappearing at a rate far greater than most global models anticipated. This more rapid pace of thaw causes Earth Systems feedbacks to human warming to be an increasingly dire issue now. As a result, we already have numerous instances of increased methane release around the Arctic. In 2011, a Russian expedition to the East Siberian Arctic shelf found vast plumes of methane 1 kilometer across rising up from the sea bed. 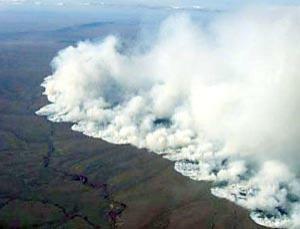 All across the Arctic, researchers are finding methane bubbling up from tundra melt ponds. The concentrations of some of these melt ponds are so high that, in some cases, they burst into plumes of flame when lit. 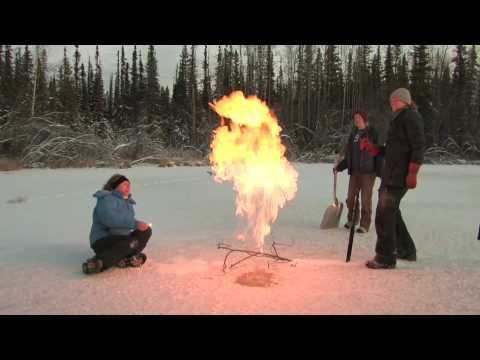 Now, CARVE is finding its own evidence of massive Arctic methane emissions. Charles Miller, NASA’s principle investigator for the CARVE project, in a recent article, noted that the mission had discovered numerous atmospheric methane plumes in the Arctic. Some of these atmospheric plumes were of immense and troubling size, stretching as wide as 150 miles across. The CARVE mission is still in progress and end results are pending. But these initial reports from Miller and his team add to the disturbing evidence already arising from the Arctic. Evidence that became widely apparent in 2012 as Arctic methane release emerged as a powerful amplifying feedback to human-caused warming. In short, it appears that the Arctic methane response to human warming began sometime late last century and ramped up throughout the 2000s. Now, the Arctic appears to be providing an increasingly powerful amplifying feedback to human caused warming. It is a dangerous situation and one that should be abated as swiftly as possible through a prompt series of ongoing actions. To these points, the following video, provided by NBC News gives excellent context. As I’m unable to embed, the link to this video is provided here. Global warming is not likely to unfold in a manner similar to the events depicted in the sci-fi movie “The Day After Tomorrow.” The pace of damage will be slower at first with weather worsening over time, sea level rise gradually worsening, and impacts to crops and agriculture increasing year by year, decade by decade. In this long ramping up period, there are increasing risks of single catastrophic events. But such events won’t have a neat finish. They will happen again and again, with risks and effects worsening as atmospheric heat energy increases. Perhaps, most importantly, humans will have to recover from these events in base conditions that are already difficult to manage. As such, human climate change represents a long emergency of increasingly worsening base conditions even as the risk of increasingly damaging catastrophic events continues to rise over time. It is this ratcheting effect of climate change that makes it so deadly. The increasingly difficult base conditions make maintenance of human civilization far more difficult even as it reduces the chance that human systems will effectively recover from a number of devastating catastrophes that are surely in the pipe. Once the climate juggernaut gets rolling it unleashes and multiplies a number of terribly monstrous and ever-worsening events. And it is for this critical reason that we need to get a handle on our carbon emissions as rapidly as possible. A grim snicker escaped from my mouth when I read that line. If humans would switch to a plant-based diet and not factory farm other beings, we wouldn’t have such high concentrations of methane. Read “The World Peace Diet” by Will Tuttle and connect the dots between out diet and global warming. I couldn’t agree more! I switched to vegan two years ago after making this connection. Have not read The World Peace Diet. But I will add it to my list. Thank you for the kind suggestion and warmest regards to you. The challenge, as it appears to me, is not being frightened into doing nothing, perfectly understandable in the circumstances, but being motivated to make changes to how we each live our lives. Millions and millions of us. In my understanding of the meta analysis, the worst part is twofold: 1) Our climate models have consistently been too conservative, and have underestimated the speed of the changes. 2) The models do not incorporate permafrost methane emission data because they are not as well understood. Perhaps these two are directly related. But we are almost certainly looking at a multiplier, perhaps a huge one, when our projections are ALREADY too conservative to begin with. Unless there’s some mechanism by which methane actually counters CO2, we are really in big trouble, and our science is asking for more time to study something before drawing conclusions, and we’re really out of time for that. The IPCC models only take into account for what they call ‘fast feedbacks.’ They primarily include atmospheric warming and the water vapor increase caused by that warming which is an amplifying feedback. Together, these two probably amount to about half of total warming once you include the ‘slow feedback’ IPCC left out — ice sheet response, ralated albedo loss, and Earth’s carbon gas emissions (methane etc). So the total Earth System Sensitivity for a doubling of CO2 (including all the feedbacks) is about 6 or 7 degrees Celsius. And we hit this degree of long-term warming, baked in, at around 550 parts per million CO2. The reason IPCC counted the slow feedbacks out, for this century at least, is that there was little evidence in paleoclimate of ice sheets responding so rapidly. But the ice sheets are responding, in some cases, 60-80 years faster than IPCC expected. So we already have a degree of ‘slow feedback’ in effect. In short, we are losing some of our albedo and we are releasing some of the carbon stocks in the Arctic. This feedback is on top of the 45+ gigatons of total greenhouse gasses (CO2+Methane+other) we emit each year. 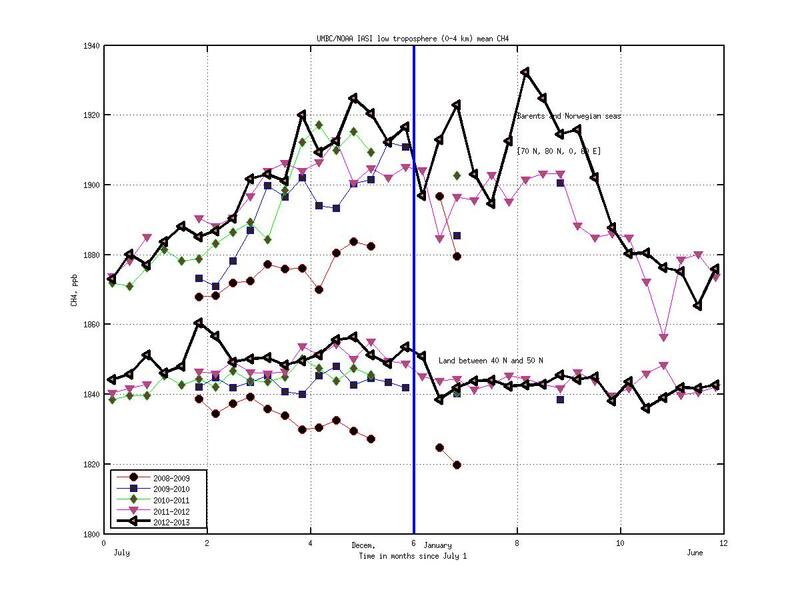 NASA’s CARVE mission is trying to determine the rate at which the Arctic methane feedback is occurring. My opinion, based on Paleoclimate evidence, is that it will likely be occuring fast enough to result in about 3 degrees Celsius warming before Earth reaches equilibrium at around 400 ppm and that this feedback will continue so long as atmospheric CO2 and methane levels remain so high. Ramping higher, we’ll see the push to around 4 degrees C at 450 ppm, around 5-6 at 500 ppm, and around 6-7 at 550. It is also worth noting that there is already enough human forcing and feedback built in to melt both Greenland and West Antarctica, long term. We build in enough to melt all the ice somewhere around 500-600 ppm CO2. There’s a new Hansen paper on a related subject which I’ll be taking a crack at today. This is a problem that is resolved with human mortality dropping like a stone. The primary cause to the 45+ gigatonnes. This will be done by the weather itself. Nobody needs to point a weapon at anyone. Mother Nature is going to sort it out like she always does. Doesn’t mean we don’t have our responsibility in curbing the situation now. this has nothing to do with cows or diet. The Arctic methane has nothing to do with cows. Permafrost melt and the thawing of seabed hydrates are the primary sources. As for emissions from human agriculture, which do occur in the southerly climes… If you’re concerned about that, I recommend buying local, grass fed animals or, better yet, going entirely vegan. What did you mean “before the earth reaches equilibrium at 450 ppm? Didn’t we just pass that? Am I missing something? The whole point of this article is that methane is rising and counts. So why do we keep on saying CO2 is at 400 ppm, instead of the total CO2 equivalent, counting in all greenhouse gases (including say nitrogen dioxide and halogens) – which various sources say take us well beyond what 450 ppm of CO2 would represent. That’s an important point to consider, one that is included in the total forcing of the climate models but that doesn’t seem to be taken into account when one considers the long-term response of slow feedbacks. To change anything, it seems humans have to feel the storms or the heat themselves, several times. Japan is setting heat records, a few heat records set today here in British Columbia, Nevada still boiling, the whole Eastern half of North America in high heat that feels worse with the humidity. The UK and Northern Europe is baking. It’s getting hot in here. Clearly the sensible thing to do is just go on burning as much oil and gas as possible and leave the problem to your children and grandchildren to deal with, because they don’t matter. I haven’t decided to be a vegan, but I have decided to eat less meat, and to find grass fed meat. I recently found some grass fed chicken eggs at Trader Joe’s today. But I also know that sometimes labels for cage-free, grass fed, etc, are not always reliable. But I trust Trader Joe’s- I can only hope my trust isn’t misplaced. I just do the best I can, which is all any of us can do, I guess. Absolutely not, Tanya. I advocate veganism as a compassionate choice that helps to reduce the harm we’re causing. But there are many around me — parents, friends, family, people like you — who do not feel as passionately about the matter or form whom such a change would seem too life altering. For my part, I didn’t become vegan overnight. I started out, about 13 years ago, by eating less meat and sticking to a healthier diet mostly devoid of red meats. My wife was vegetarian at the time, and I, the cook, was able to reduce my meat intake to about 3-4 times a week over the next few years. And there I stayed until about three years ago when I developed a very painful gall stone. After surgery, the doctor recommended I stay away from fats, milk, and sugar, but especially animal fats. My wife, concerned about my health, purchased me the book “The Kind Diet,” which I read. I had been working on a number of sustainability research projects at the time but I was disturbed to discover that industrial farming and, in particular, meat farming contributed about 20-30% of all carbon emissions and greatly reduced food security for billions of people. For example, the US can feed about 600-800 million via its harvest, but if all US production were vegetable, grain, and non-meat/dairy based, that number would jump to a stunning 8 billion. With climate change starting to ramp up and put the world’s crops at risk, I figured that the best thing I could do for myself and for others is to make a switch to veganism. It was a switch and contribution I could make on an individual level which might have an impact, regardless of how much money I made. The switch, for me, made me part of a solution. But for the majority of my life, I was you. I am content to advocate veganism and less meat consumption overall. And I am content to advocate for a switch away from factory-based farming and from land-use techniques that are so emissions intensive. I believe such actions will make us both more resilient and more caring for ourselves and for the creatures we depend on as well. And while I am definitely in the business of calling out people who unwittingly or wittingly protect oil company special interests by adhering to a number of failed ideologies including climate change denial (nothing’s happening) and the related doomerism (nothing can be done), I am not in the business of blaming people for their diets. In this respect, I feel that advocating conscious, compassionate action is enough. And so, no, I do not hate you. But I do hope that one day the options will be available for you to make these choices. Thanks for understanding! I really respect your opinion. I read the book “The Omnivore’s Dilemma” which talked about a lot of what you are saying. I definitely looked at food differently after reading that book. I’ve actually bit read that one. What did you think of it? It’s really good. It’s beautifully written, and the author, Michael Pollan, did a lot of research for it. He went to industrial farms, organic farms, and tried local food as well to compare which was the healthiest, most affordable, and environmentally friendly. Of course, there’s no perfect food, but he found that the best way to eat is to buy locally grown food (which is difficult if you live in the city or suburbs). He also talks a lot about our over-dependence on corn in America. I’m not sure if he’s a vegan or not, although he ate meat at the time the book was written. He also explored the “cave man” diet in which you only eat what you hunt, as well as eating local nuts and fruits. The diet also calls for no grains. He found that way of life very tiring and not always successful in terms of always catching what you hunt for. You sound like you already know a lot about this stuff, but you might enjoy reading it anyway. Sad to say, but the detractors likely far outweigh the benefits.